I found out about that one while perusing Tasha/Heidenkind’s excellent blog, Truth, Beauty, Freedom, and Books – thank you my dear for mentioning it! honeymoon to Paris and Amsterdam, a trip she was dreaming about. Will she manage to overcome her trauma and return to her family happier? How will she deal with the outside world completely on her own? At first glance this Bollywood comedy/drama had everything you need to spend two satisfying hours in front of your TV set/computer screen, drinking wine and chuckling merrily from time to time. A young ingenue, sweet and sensibly exotic, who slowly gains her independence. A scenic European tour, exposing clashes between European and Indian cultures. An alpha-hole fiance who thinks the Moon and stars revolve around his head and is taught a lesson. All of it was supposed to make me nod or even swing my head and smile most of the time. It left me bored instead, bored and annoyed. 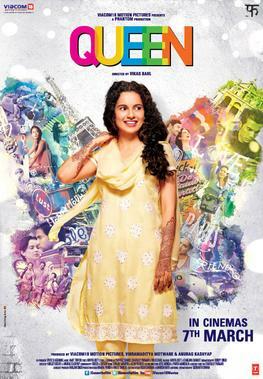 Rani Mehra (Kangana Ranaut), an under-confident daughter of a shopkeeper, is ditched almost at the altar. The whole process should have been like a thunder but it takes almost half an hour in the movie. I know Indian movies have their own rules and pace but, in my humble opinion, many scenes of this one should have been shortened or cut out completely. I felt as if the director repeated some ideas over and over again because he thought I might be as obtuse as the heroine of this flick. Which directs me toward my biggest complain. Rani. I get it – she was a young, shy, sheltered girl, not especially educated, without any higher interests apart from marriage and, perhaps, cooking. A good girl who loves her family, listens to her teachers, does as she is told, and has a FB profile. It would still be fine if only Rani, while traveling abroad, showed any interest in Europe, French cuisine and/or history, Dutch cuisine and/or history or, in fact, any other related topic. No such luck. For her an exciting experience means getting sozzled in public, preferably while not wearing a bra in a disco, and being almost arrested by a local cop; yes, she loves cooking but French cuisine means just a disgusting bit of raw fish head with a small tomato in its prominent teeth, a ‘dish’ served, allegedly, in the only French restaurant she visited at a whim. Something that made her puke. It was obvious she thought they had it all in New Dehli, only they made it wayyyyy better. She also never bothered with even most superficial research concerning France, Paris, Amsterdam and Europe, even though her FB profile and discussions with her family on Skype suggested she had to have some previous knowledge about the internet and computers. I admit I liked the ending the most as, for a change, Rani didn’t find the love of her life but it was a tad too little and a bit too late too. After seeing how many prizes this one won I expected something better. Perhaps Bollywood, their sweet-sweet heroines, repetitive music, and simplistic stories are not for me. Plus Paris without catacombs is not the right kind of Paris. This entry was posted in Bollywood comedy drama, meh, movie review, rating and tagged 2014, a stupid heroine, bollywood, boring, indian movie, not for me, queen, vikas bahl. Bookmark the permalink. Lol you and the catacombs. I enjoyed it, although I agree the Paris section was weak. It seemed like she spent 90% of her time in her hotel room. Goodness….sorry about that. I have never really watched a full Bollywood from beginning to end before I really don’t see that as a plan in the future. I’m going to steer clear of them as well. One movie was enough.